I bought the Urban Decay x Gwen Stefani palette last month before Winter Break after seeing it in person for myself at Sephora. I completely fell in love with it, but I'll admit that I was a little "iffy" at first. When a few of my fellow content creators confirmed that it was a must-have, I waltzed back into Sephora the next day with my loyalty gift card (perfect timing) and purchased it. One thing that really made me skeptical was that a majority of the palette consists of neutrals and I already own the Naked 2 palette; however, the shades are pretty different with new names that reflect all things Gwen. The only repeat shadow that is present in most Urban Decay palettes is 'Blackout' which is highly appreciated because it's such a gorgeous true black. The second thing was the price. Just like any consumer, I'm very picky about what I spend my money on. I spent a lot of time trying to figure out whether $58 was worth it or not! The Sephora Beauty Insider gift card helped, but otherwise, I might have still been contemplating the purchase to be completely honest. If you follow me or have read my blog before, you'll know that I'm a sucker for beautiful packaging and Urban Decay did a fabulous job with this palette. If anything, I think this one is a collector's item and it's unique compared to past UD palettes in my opinion. The photos really speak for themselves! The details are perfect with everything from an engraved antique bronze plate to beauty inspiration straight from the lyrics of a No Doubt hit in the lower right corner of the mirror. As I mentioned above, the majority of the palette is neutral, but there's a row of color pops at the bottom that I really wanted. The great thing is that if you have some (or all) of the Naked palettes, you'll be able to use these shadows with them. If you're looking for a palette of completely new bright and vibrant shadows, you probably won't find it in this palette and might be better off purchasing another UD palette where there's a little more color. I've purchased some of the old UD palettes with more color, but never used them a ton. I've been able to use the Gwen Stefani palette everyday and add a surprise of color if I'm feeling it that day. Lately, I've been lining my lower waterline with 'Danger' and it's pretty stunning! 'Punk' has been my go-to color. It's the perfect brown and I'm 100% positive that it's going to hit pan first. There's also a nice balance of shimmers and mattes. Below are swatches from the entire palette without primer. The color payoff is excellent as always from Urban Decay but, of course, they look even more vibrant with the Primer Potion. 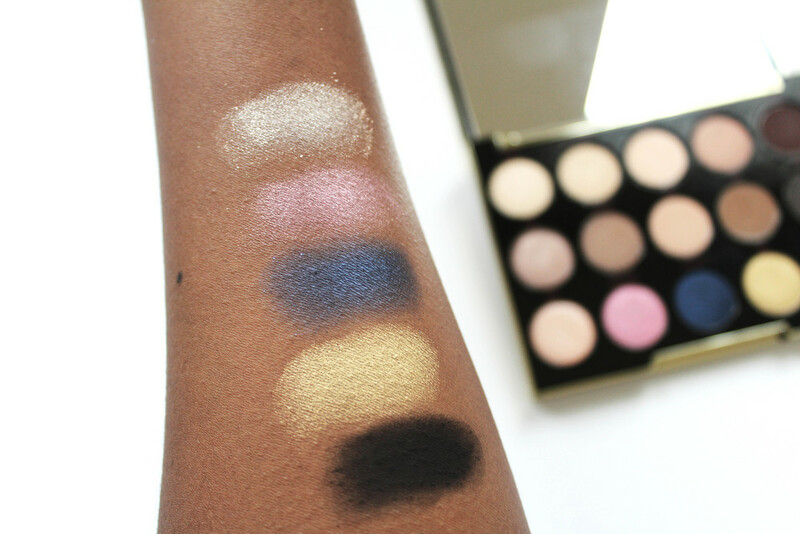 What really got me with this palette was the buttery softness of the shadows. While they're not as butter as ColourPop, they're still pleasantly soft and blend beautifully to create the perfect look. If you've purchased the Urban Decay x Gwen Stefani palette, I want to know what you think! Is this UD palette worth it for you?